My student Hannah Adams writing about Sage Garver’s BFA Sculpture thesis exhibition BIO, in the School of Art’s Dutzi Gallery on 9 November 2016. The exhibition uses three of the four white walls as part of the exhibit. From the smooth blankness, rounded shapes emerge. The same shapes are often repeated. Small rings are very common, often grouped together to look like bubbles or cells. There are also half circles and rounded bullet-like shapes, along with some flattened and striped strips. These forms are all rather regular. The have an organic quality, but a regulated one. They have the look of healthy, functioning cells. Interspersed in this mix are shapes that do not seem so normal. One cluster of half circle shapes show the forms flattened with nodules breaking the smooth surface. One malformed circle farthest from the group looks as if it has burst, since thick, fungal-like tendrils are growing out from it towards some of the more ordered “cells”. These more chaotic loops that grow out are found dispersed throughout the ordered shapes. The feeling is a bit sinister, like watching a toxin or disease slowly invade a healthy system. The color white almost contrasts with this, since white is generally the color of cleanliness and sterility. But it is also the color of hospitals, and generally you wont be in a hospital because you are well. This piece can also be looked at in a slightly different way. The white color with white shapes coming out of the plane resemble what is called an unstained brightfield microscope slide. Essentially, cells are plated directly onto a slide and viewed with no enhancements. This makes the cells appear to be only slightly contrasted against the white backdrop of the slide. With this view the exhibit walls could be seen as more scientific. The scale, though, is quite overwhelming. A slide and the cells on it are small, smaller than your hand. But this exhibit makes the microscopic organisms big enough to touch. Any scientist who has looked into a microscope to watch paramecium devour each other in a drop of water, will feel definite discomfort in an exhibit that seems to put them right in the middle of that microscopic frenzy. The overall feeling of the walls is disconcerting and distinctly alien, a feeling heightened by the dim lights. The center piece is slightly different from the walls, though. It is composed of draped gold chains brightly lit, with a crumpled, glittering, bluish ball in the center. This part seems more artificial, like an unusual centerpiece at a glitzy party. The contrast between the two produces more discomfort in the viewer. In order to understand Sage’s work, one must first understand the title: BIO. This three letter abbreviation is not as simple as it seems. These three letters are the shortened form of two very different words: biology and biography. Though upon closer analysis the two are much more closely related than thought, and in this exhibit they are brought even closer. They both contain the prefix bio, meaning life. Put simply, a biography is the story of a person’s life, while biology is the study of all living organisms. They share some basic meaning since both deal with the understanding of some kind of life. In Sage’s exhibit she explores many themes and this interplay between the two words is one of them. 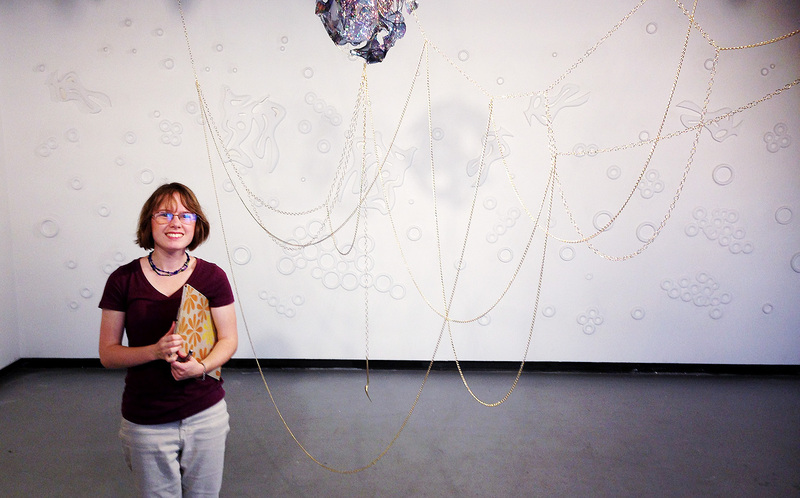 Her exhibit was inspired by an illness that has greatly affected how she lives her life. In a way this exhibit is then a biography of her, since it details a part of her that has affected so many aspects of herself, even down to the foods she can and can’t eat. The biology part comes from the origin of her illness. It had a biological source, and so her exhibit reflects this, with many parts representing the transition from health to sickness at the cellular level. The walls of her exhibit are meant to represent this transition. The walls are meant to represent the interior of a body, with the clean, white space being a healthy and functioning system. The malformed shapes are meant to be representative of malfunction and disease emerging from this healthy system. Sage had less to say about the centerpiece of the exhibit, however. She only told me it is representative of the connection between outside appearances and inner sickness. Attached to the golden chains is a small gold fork. This is connected to Sage’s inability to eat her favorite foods, one of her most unpleasant ailments. It is also an example of a surface manifestation of her illness connected to the internal cause. Sage was successfully able to use sculpture to show the connection between her disease and her life story.Through metal and, plastics, and other materials, she showed the deep connection the biology of her disease has with the biography of her life. Of the many sculpture displays I have seen, this one had the most immediate feelings associated with it. Most sculpture exhibits I have seen have just been about smaller, individual works, and understanding them separately. Though they were generally connected by a hidden theme. Since the whole exhibit was the sculpture, nothing could really be escaped and every part was important to the whole. I have to say I really enjoyed this experience. Going into this exhibit, was like going into another world. The scale would make anyone feel small. And since the theme caused the walls to resemble microscopic organisms, this feeling of smallness was heightened. This was quite fascinating. Being a Biology major, I have to spend a lot of my time looking through microscopes often at live samples. It never ceases to amaze me when I see the huge variety of life that exists in a tiny drop of pond water. I enjoyed this exhibit because it brought me closer to the microscopic worlds I so often observe, but can never experience first-hand. But I also related to Sage’s more personal story behind the piece as well. I have thankfully never had to deal with a chronic illness other than occasional migraines, but my brother has. He has severe asthma, and so is often out of school for many days when he is sick. I found it interesting that Sage used her time to turn to art, because my brother did the same. He can spend hours with calligraphy, making amazing pieces with just a simple pen and paper. I talked with Sage a bit about the connection between chronic illness and art, and she said she hadn’t given it much thought. I wonder if Sage herself may have never found her creative streak if not for her unfortunate sickness. It would be fascinating to know if others have had similar experiences. It would be interesting to see if prolonged sickness promotes artistic creativity in more than just Sage and my brother. Because we can’t escape the biology of our bodies, maybe they can at least influence the biology of our lives for the better. My student, Hannah Adams, visiting Sage Garver’s BFA Sculpture thesis exhibition BIO, in the School of Art’s Dutzi Gallery on 9 November 2016.